Soak up the Christmas market atmosphere as you browse more than 100 stalls offering a wide range of Christmas gifts and decorations. 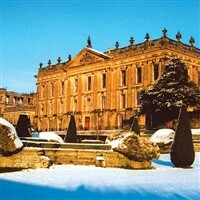 Where better to start your Christmas shopping than at the Chatsworth Christmas market? With over 100 market stalls offering a wide range of Christmas gifts and decorations, it's a great way to start the festive season. You can also explore our own exclusive ranges in the Chatsworth shops  the Orangery shop in the garden and the Stables shop  with a wide range of unusual home and fashion gifts, and lots of lovely stocking fillers. Take a break from shopping and enjoy a mulled wine or a German beer at one of our outdoor bars, or sample some delicious food, with gourmet burgers and sausages, hot pork rolls, pancakes, churros and more. There's live music too, guaranteed to get you in the festive spirit.